Inspired by Iceland’s volcanic geology, Eliasson has enveloped the building with multiple glass and mirrored hexagonal shapes that allow the building to reflect different colours depending on the light conditions. This reflection of colour and light also continues within the building as a second inner wall of glass, made up of the same hexagon like shapes, stands directly behind the outer wall. As the light beams through both glass walls a continually changing array of shapes and colours appear inside the building;this kaleidoscope of light is aided further by Iceland’s endless, truculent summer days and dimly lit winters, allowing the building to project different colours according to the season. Eliasson has added plenty of character to a building that, from a distance, could be mistaken for a glass office block, not a concert hall. However, on closer inspection it becomes clear that the building serves a much grander purpose, especially when the mass of hexagon glass shapes come into view. 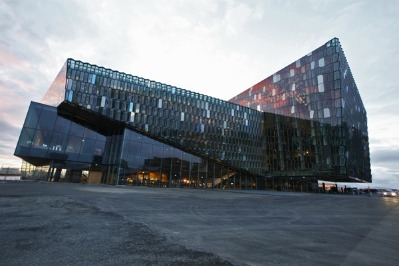 In the past Pilkington products have been employed to construct large buildings, like the Harpa Concert Hall, that are used for performing arts. 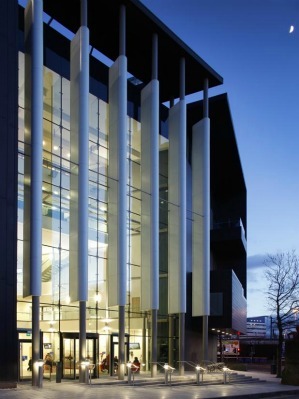 One of the more recent examples is the Centre of Excellence in Leeds that is the new home for Northern Ballet and houses the Phoenix Dance Theatre. The pièce de résistance of the building is a grand entrance area which showcases Pilkington Planar™ as the focal point of the six-storey building. There are also two glass box balconies on the side of the building which offer stunning views of the surrounding area. The Pilkington Planar™ system allows architects to apply bold designs whilst affording them stability and safety. It is qualities such as these which ensure that Pilkington Planar™ remains world leader in the cutting edge market of bolted glass systems. The Pilkington Planar™ structural glazing system provides a flush glass surface, by utilising stainless steel fittings housed in countersunk holes to fix the glass façade back to the structure instead of using the more conventional framed systems. The result, as demonstrated by the Centre of Excellence of Dance in Leeds, is a fully engineered system with the minimum amount of support structure and the maximum possible visual clarity. For more information on Pilkington Planar™ glass building products visit the Pilkington website here.